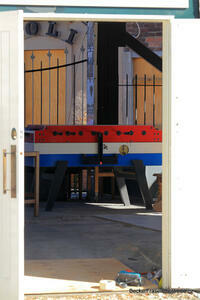 A foosball table in the seating area outside Goodbye Blue Monday, a bar and music venue off Polar Lane. 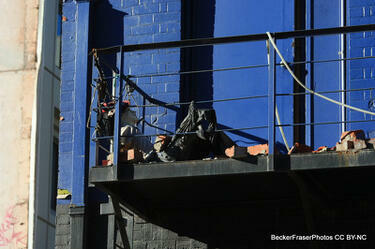 Photograph captioned by BeckerFraserPhotos, "112 Hereford Street". 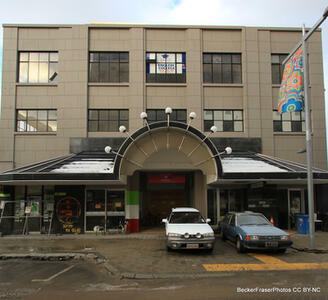 Photograph captioned by BeckerFraserPhotos, "181 Cashel Street". Photograph captioned by BeckerFraserPhotos, "Intersection of Cashel and Manchester Streets - north-east view". Photograph captioned by BeckerFraserPhotos, "Intersection of Cashel and Manchester Streets - north view". A photograph of the Treehouse Bar and Manchester Courts taken from the intersection of Manchester and Cashel Streets. Wire fencing has been placed across the street as a cordon. 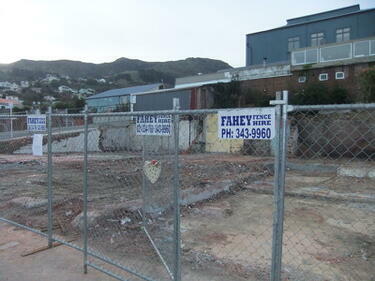 A photograph of the sites of the demolished Lava Bar, Volcano Cafe, and Lyttelton Fisheries on London Street in Lyttelton. 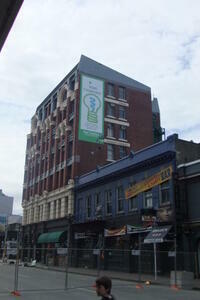 The north-west corner of Manchester Street and Cashel Street. A photograph captioned by BeckerFraserPhotos, "The Port Hole bar has become an institution since it replaced the demolished Volcano cafe". 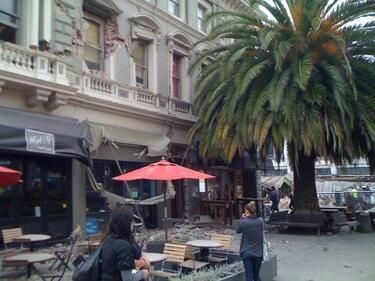 Damaged buildings along London Street. Wire fencing has been used to keep people away. 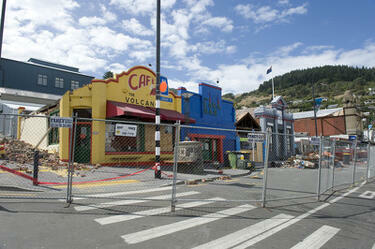 From the left are the Volcano Cafe, the Lava Bar, a fish and chip shop, and the Coastal Living Design Store. 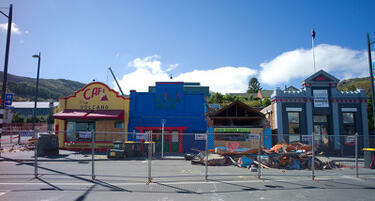 Rubble from the side of the Volcano Cafe can be seen along the Canterbury Street footpath. 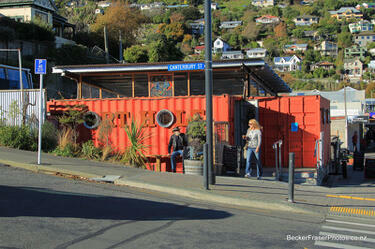 A view across London Street in Lyttelton to The Volcano Cafe, The Lava Bar, and Coastal Living Design Store. Masonry from the buildings has collapsed onto the footpath, and the site has been cordoned off with wire fencing. The buildings' yellow recycling bins are still waiting on the curb for collection. 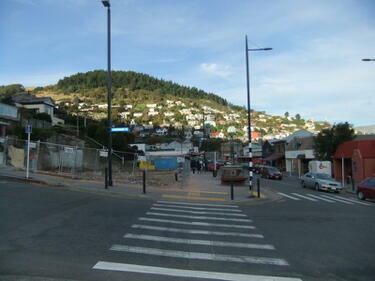 A view across Canterbury Street in Lyttelton to The Volcano Cafe and The Lava Bar. 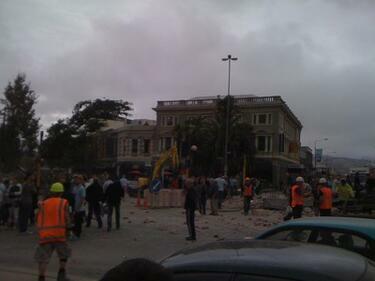 Masonry from the buildings has collapsed onto the footpath, and the site has been cordoned off by a safety fence. 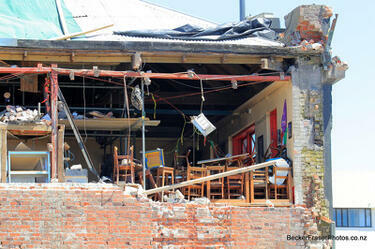 Damage to the Fuze Restaurant and Bar on the corner of Oxford Street and Norwich Quay. The top of the building facade has crumbled into the street below and wire fencing has been placed around the building as a cordon. 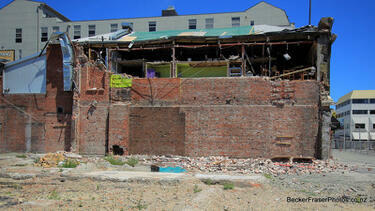 A view down Sandyford Street towards Colombo Street showing damage to Rob Roy's Scottish Bar, the outer wall of which has collapsed.